Can I Combine Rose Quartz, Amethyst And Clear Quartz For Healing? Hi I have been using Amethyst and Rose Quartz lately by placing them underneath my pillow to get over my past issues and blockages from having bad relationships/wrong decisons. I have ordered Clear Quartz from your online store. My query is: can Rose Quartz, Amethyst, and Clear Quartz be used to together. I was thinking of ordering Charoite, but was not sure about using the combinations of these crystals. 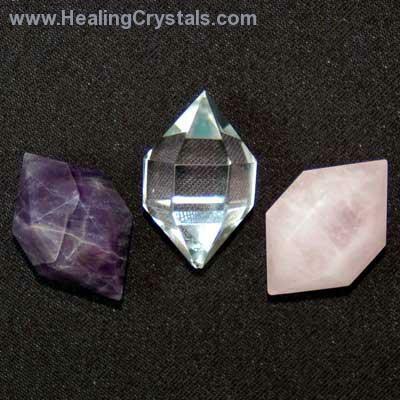 Thank you so much for your question about whether you can use Rose Quartz, Amethyst and Clear Quartz all together. Yes you can and since they are all from the Quartz family they really work very well together. The Clear Quartz is going to amplify the energy of the Rose Quartz and Amethyst so that you should feel the energy flowing more through your home and your life. You mentioned that you were using these to get over past hurts and Snowflake Obsidian popped into my head. I think you could use a good grounding crystal and Snowflake Obsidian is excellent for dealing with grief. It helps you to feel it (because you've got to do that to get past it) and then understand why things happened the way that they did. It will also help you to take the best of the situation and get rid of the rest of it. If you feel drawn to Charoite then you should try working with that as well. Very often the crystals that can help us let us know and we just aren't paying attention...the crystals always choose us whether we know it or not! Charoite is helpful for getting over the past because it teaches us to focus on the "now" and leave the past where it belongs....in the past! It will also help you to get the best out of the past and eliminate the bad stuff that is only holding you back. All of the crystals will work well together so don't worry about them "cancelling" each other. Thank you again for your question and for your support of Healing Crystals.com. I hope that I was able to help you and that you will let us know if you have any further questions. Things will get better and I'll be thinking about you. Wishing you of Love and Light!